A popular subject amongst some of the staff here at the Library is Conspiracy Theories. The paranoid part of me can’t get enough of them; the concept that there is an over arching plan by those in power, be it secret societies, governments, business leaders, or secret societies made up of business leaders, or governments filled with secret societies, to ensure that the general populace is kept in the dark about aliens, new technologies and the meaning of life. The latest book that’s doing the rounds is The Mammoth Book of Conspiracies by Jon E Lewis. 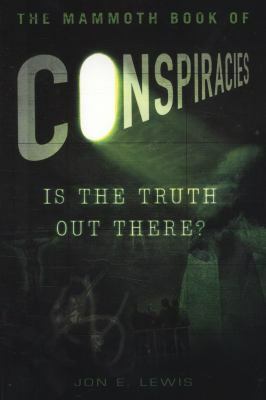 Unlike most conspiracy books, this one is very well written, with an objective viewpoint, providing a somewhat tongue-in-cheek, yet open and clear evaluation of many of the popular and not-so-popular theories out there. Lewis tackles the ridiculous theories, identifying the historical facts that have been twisted, and isolating events that have simply been misinterpreted. However, there are some theories that with his open and clear investigation methods point to the possibility that there truly is something sinister, a cover up, or a misinformation campaign. He documents interesting facts like the infamous Area 51 was often behind the source of alien technology theories, simply to mask the fact that secret military aircraft were designed and tested there. Or that The French Government truly did cover up the traitorous involvement of an officer selling secrets to the Germans, to hide an administrative error made in the years prior.